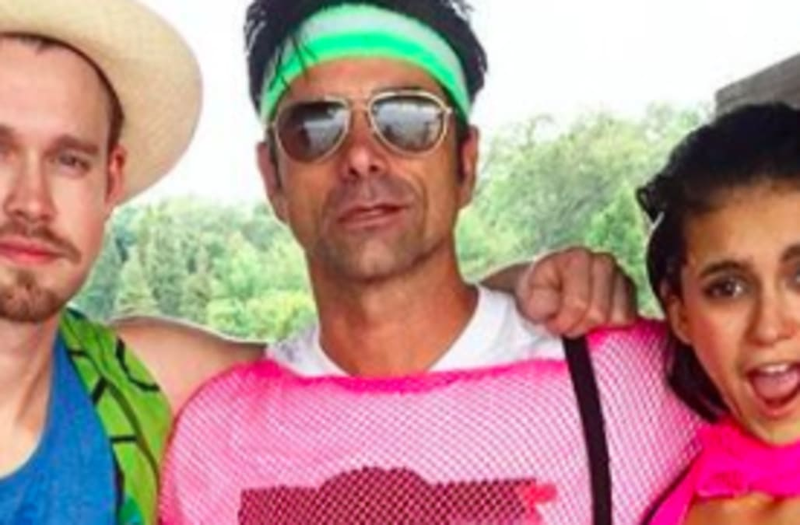 John Stamos wore an Uncle Jesse shirt at Nina Dobrev's '80s-themed Labor Day party: Pics! Labor Day weekend was a chance for John Stamos, Nina Dobrev, Chord Overstreet and more stars to turn back the clock! A big group of celebrity pals visited the lake for the holiday weekend, turning the get together into an epic ‘80s party. “We refuse to let #summer or #the80s be over! @nina @chordover#laborday,” Stamos, 54, captioned a shot with the two actors. In the pic, the Full House star is wearing a T-shirt of himself as Uncle Jessie along with a fishnet top, pink shorts, neon purple leggings, and a sweat band. Dobrev, 28, sported a pink and blue ‘80s-style bikini, and showed off her love of the decade in several fun posts. The unlikely celeb pairing didn’t explain what brought them together, but they were also joined by New Girl’s Lamorne Morris and Scream Queens star Glen Powell. The friends shared videos playing a Slip N’ Slide version of flip cup, jumping into the lake, playing paintball, and more.